Crazy costumes, spooky decorations, and massive amounts of candy—what’s not to love about Halloween, right? Right. Tell that to the parent of a young child. All the fun of Halloween can quickly be zapped by an ill-fitting costume, a house that’s too scary, or a kid with a sugar-induced belly ache. 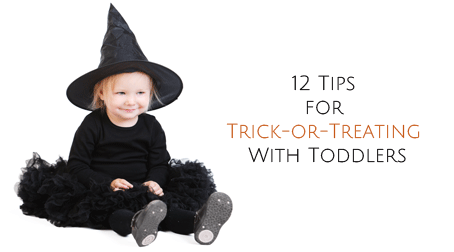 Keep your All Hallows’ Eve enjoyable (and safe) with these twelve tips for trick-or-treating with toddlers. 1. Choose the right costume. There are some adorable costumes out there, but remember that simple beats cute-but-complicated any day of the week. Avoid itchy fabrics, elaborate headpieces (your kid won’t keep it on anyway), and outfits that don’t fit properly—just imagine your child tripping on her princess dress on the way up your neighbor’s doorstep, causing candy to fly everywhere! Comfortable shoes are also a must, no matter how cute the princess heels look in the store. And most kids don’t like wearing masks for long, so try nontoxic face paint instead. Even if you aren’t intending to be out after dark, it’s not a bad idea to slap some reflective tape over your toddler’s costume, just to be safe. Take a small flashlight along, too, in case you end up candy-gathering for longer than you expected. 3. Talk about Halloween etiquette. Have a short conversation beforehand about how only a single piece is allowed at each house unless the homeowner indicates otherwise. That two-minute chat could save a lot of headaches later in the evening. 4. Inspect all candy before anything is eaten. An adult should always look through the loot first to identify possible choking hazards, foods your child is allergic to, and any candy that’s open or just looks off. 5. Prep for unexpected surprises. Being scared is part of Halloween’s charm, so chances are high that at some point someone will jump out and say “boo!” or you’ll pass an older trick-or-treater with a seriously terrifying costume. But those kinds of unexpected surprises can be too frightening for a toddler. Be sure to prep your little one ahead of time; explain that some people enjoy feeling a bit scared, and that none of it is real. 6. Skip the super spooky houses. Some people get really into their Halloween decorations. If you come across a house that you think will overwhelm your toddler, don’t feel bad steering him in the opposite direction. Go early in the evening, and keep it short. Young children can’t hold up for too long, and everyone will have more fun if you stop before they’re too tired or overstimulated. 8. Have a candy plan. The temptation of a bucket full of candy is too much for a toddler to resist. (Heck, it’s too much for most adults to resist!) So go into it with a plan. Tell your child ahead of time how many pieces she can eat that evening, how many she can have each day throughout the next week, and when the candy will be gone. Handing out candy to other kids—with or without a costume—is often just as fun as trick-or-treating for young children. Just be sure to choose candy that’s toddler-friendly, since inevitably a few pieces will end up in his mouth. Go right before you leave the house, just like always. Also, plan your route to have a stop back at home or at a trusted neighbor’s house, in case your toddler needs to go again. It also helps to choose a costume that makes going to the potty easy—a long skirt that has to be lifted over her head or a head-to-toe costume that needs to be taken off completely just makes things more complicated than they need to be! 11. Pick an appropriate candy bag. Make sure it’s small enough for your toddler to hold himself and has an easy-to-grip handle. A small backpack is another toddler-friendly option. An early dinner or large snack will help ensure your kid isn’t begging for candy—at least not out of legitimate hunger!—all night long. ABOUT KATIE: Katie Markey McLaughlin, M.S., is a freelance journalist and blogger, plus mama to a very energetic toddler. She’s also downright tired of trying to have it all. 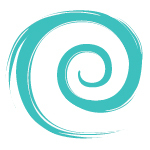 Her blog Pick Any Two encourages moms to do anything, but not everything. * 5 Halloween Traditions: Let Them Eat Candy!